Its little secret that the Patient Protection and Affordable Care Act is controversial, although dozens studies and surveys show unequivocally that Americans aren't so much opposed to the law, rather, most have mixed feelings on the law. Further analysis shows many of those mixed feelings can be attributed to the fact that so few Americans truly understand the law, and the reasons are because of the messaging lawmakers (most notably opponents) have used to describe the legislation. Also, supporters of the law have done a downright terrible job countering depictions of American opposition as somehow being the common opinion of this law. If you think back to similar efforts to try and reform the byzantine healthcare industry in the U.S., most notably the 1993 Clinton healthcare plan (known officially as the Health Security Act), a reform package proposed by the Clinton administration, but was more closely associated with the chair of the task force devising that plan, then-First Lady of the U.S., Hillary Clinton, and you see clues as to why efforts to reform the U.S. healthcare "system" (a term I personally use very loosely, because U.S. healthcare is less of a coordinated system than it is a group of entities trying to skim a profit off the illnesses of others) have struggled to win favorable public opinion. That also explains why the Patient Protection and Affordable Care Act ("Obamacare") has has such mixed opinions. But the Clinton plan was never implemented, and importantly, the Affordable Care Act's supporters learned a few things from that experience when they tried again in 2010, sewing the seeds to the latest last-ditch efforts by the losers to get their way one last time. The British magazine The Economist recently featured a chart on this important law (and it IS U.S. law; it went all the way to the U.S. Supreme Court and was upheld there as lawful). The Economist notes that new computer analysis (see HERE) counts the GOP policy ideas that overlap with other bills that made it into the law: 3% from the House and 8% from the Senate. In fact, when "mark-up" bills are excluded — basically, amendments and legislative re-writes—11% and 28% of policy ideas from Congressional and Senate Republicans, respectively, align. John Wilkerson of the University of Washington and his colleagues studied the legislative history using big data. They ran the PPACA through a text-analysis system that could spot similar wording in previous legislation with a better than 90% accuracy. That let them identify the date and sponsor of earlier bills that ended up in the law, indicated as circles in the chart. Hence, proposals by Republican Senator Chuck Grassley of Iowa on nursing home transparency in March 2009 were incorporated by Democratic lawmakers in later bills, before appearing in the law. 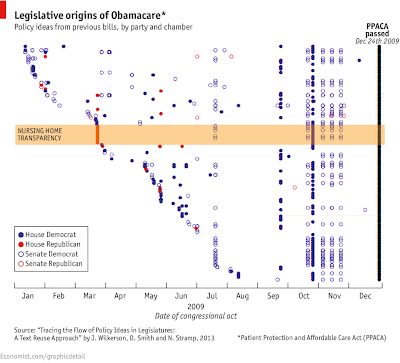 Hence, The Economist notes that on the surface, Obamacare looks totally partisan, largely because not a single Republican voted in favor of the legislation when it was still a bill. However, the analysis shows that the law is filled with a lot of concessions to Republican opponents, which helps explain why many continue to oppose this law like sore losers: much of this law uses Republican ideas, making their defeat on this even more humiliating. Add to that a stunning defeat by the Supreme Court, and you have the recipe for ridiculous Congressional theatrics like Texas Senator Ted Cruz's recent non-filibuster (it can only be considered a filibuster when legislation is actually pending a vote). Yet when respondents are asked how they feel about "Obamacare," they're overwhelmingly against it. Still other research shows shows some big demographic differences. For example, Americans in the 18-29 age group are the most likely to be uninsured (22%) also, perhaps not surprisingly respond most favorably to Obamacare, with 51% opting to keep it. By contrast, Americans age 65 and older are the least likely to be uninsured because they're collecting Medicare (3%) are also the most likely to object to Obamacare, with only 32% electing to keep it. These results are from a recent Bankrate survey on the topic which can be viewed at http://prn.to/1bCtdtt. There are other studies which show that Hispanics, another group less likely to receive employer insurance coverage, also like the law. Simply stated, Americans' views of the law varies considerably depending on how it is described, and whether a person is insured already or not. First, The Affordable Care Act now the law of the land, so disregard suggestions (and Congressional theatrics) to try and defund it. That train left the station several years ago, and some are sore losers about it. However, my readers may recall that on September 24, 2013, I Tweeted a Bloomberg article by Paula E. Dwyer entitled "Five Republican myths on defunding Obamacare" (see the article at http://bloom.bg/16EYMuL). Myth No. 1 was that shutting down the government would somehow stop the healthcare law from taking effect. As it turns out, most of the health law's funds come from the entitlement programs Medicare and Medicaid, which don't need Congress's annual blessing, so a shutdown would do almost nothing to "defund" the law because the funds for Obamacare aren't even subject to Congressional debate. The reality is that in spite of technical issues, the marketplaces were opened, and the government reported that within 24 hours of its 12:01 a.m. launch, the Department of Health and Human Services' health-care website (http://www.healthcare.gov/) had received 4.7 million unique visitors. By the end of Day Two, the number was greater than 7 million. (HHS has not yet released the number of those who have actually signed up for coverage.) By week's end, demand was still so great the website, HealthCare.gov, remained difficult at times to get into, despite the addition of more computer servers. Second, if you're someone with a chronic medical condition like diabetes, you are a major beneficiary of this law. You can now buy healthcare insurance whereas in the past you weren't even permitted to buy insurance at any price except in states which had laws prohibiting insurance companies from doing so. As it turns out, such laws also significantly increased the costs of plans in those states, but those same states also saw the smallest increases or even decreases after "Obamacare". Discussions about the cost have generally ignored this not so little fact; many people can now buy insurance who were discriminated against in the past, a major, major factor in the reasons why rates for many were so low in the past. Now, if you have diabetes, you CAN buy healthcare insurance, whereas in the past, you were out of luck. Is that how free markets are supposed to work? Indeed, several states including California, Colorado and Connecticut which are running their own exchanges have reported significant interest. Connecticut, for example, reported that the number of of people looking into healthcare plans online or by telephone was far more than Access Health CT CEO Kevin Counihan had anticipated. There were even reports from HHS that in states like Kansas which have deferred all Obamacare administration to the Federal government, also had high consumer interest in Obamacare. Opponents claim they will see a different picture when the bill for Obamacare come due, neglecting the fact that in the U.S. today, bankruptcies resulting from unpaid medical bills are forecast to affect nearly 2 million people this year—making health care the No. 1 cause of such filings, and outpacing bankruptcies due to credit-card bills or unpaid mortgages, according to data derived from the U.S. Census, Centers for Disease Control, the federal court system and the Commonwealth Fund and crunched by NerdWallet Health. That suggests that the cost of insurance is more than offset by a single costly hospitalization. The reality is that the United States is the only advanced, industrialized economy that did not offer universal healthcare until the Affordable Care Act became law, and while there will be refinements that can be made over time, yet nearly 6 in 10 Americans disapprove of trying to stop the law by cutting its financing. Besides, Congress has already funded it, and the chance to defund it ended in 2012. Lawmakers who are opposed lost their opportunity to do this over a year ago. Even among those Americans who don't especially like the law, less than half want their representatives in Congress to try to make it fail. The reasoning seems to be it was passed into law by legitimate means (indeed, the Republican party itself had used the same Congressional procedure in the past), and it addresses a legitimate U.S. need, so they want to see it have a chance. Since the repealers have suggested no alternatives other than to kill this law, they have failed on several levels. Most Americans want to see how things end up working with Obamacare, and expect their lawmakers to do the same. Author P.S., October 30, 2013: Its not really a secret, we've known that once the Affordable Care Act was implemented, substandard insurance plans would be replaced with better, stronger coverage. That also means that the really low-cost healthcare plans are likely to disappear, although such plans are insurance in name only. Bare-bones insurance coverage tends to cover only outpatient hospitalizations, and they don't typically cover ambulance service or even basic prenatal care. The so-called benefits that such plans actually do provide may include generic drugs (many of which can be attained from major pharmacies for as little as $10 for a 90-day supply without insurance), and certain doctors' appointments are covered with a $50 co-pay. The price for such an "insurance" plan: $54 per month, which is low by almost any definition, although certain media outlets are describing the fact that the individuals impacted cannot afford more. The Washington Post recently reported one example (see http://wapo.st/1aPebdz for the article) that Fox news highlighted. However, the bare-bones plans which are disappearing and are really better described as a "pray-that-you-don't-really-get-sick 'plans'" because those plans (if they even deserve the description of insurance at all) don't cover cover much of anything. The example cited failed to cover “extended hospital stays" whereas hospitalization is among the core requirements for health-care plans under Obamacare. As the Rachel Maddow show described it (see http://on.msnbc.com/1g9gteR), "In other words, the new horror story for critics of the health care law features a middle-aged woman trading a bad plan for a good plan, and health care insecurity for health care security." Many of the sensationalized stories of complaints (highlighted by Fox News) by people who are seeing their monthly costs jump under the new Obamacare plans are conveniently omitting the fact that many people including the woman featured in the Fox News story, will actually be eligible for subsidies under the Affordable Care Act, hence the cost of the coverage being reported isn't what these so-called "victims" of Obamacare will actually have to pay out of their own pockets.